Speaking in front of a huge crowd is a rush. It's even better when they laugh at proper places (which they did). Proper preparation definitely pays (and paid) off! A two-man presentation is doable, but has some logistical difficulties. Next time, we should try to do separate one-man gigs. Time to start figuring out what to talk about! 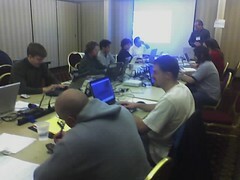 Never assume that just because the hotel offers wireless network access, it will be any good. Kid is all kinds of wacky inside. But it's getting better. Recursive generator functions are fun! Speed tests are a great idea... except when they take too long to run. A whole lot of stuff seems funny after a couple rounds of sangria. 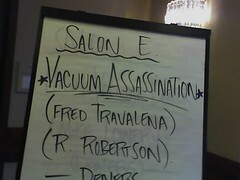 It is possible to assassinate a vacuum. And to be 10,000 percent positive about it. Who knew? Hacking on IM chatter bots is fun too. The temperature at a conference is a fickle thing, capable of flip-flopping from ice planet to geek sauna and back again throughout the course of the day. When your mom said to dress in layers, she knew what she was talking about. "Those hacker people are scary." They do, in fact, make cheese spicy enough to cure a head cold. The American Airlines fax-yourself-a-boarding-pass is a great idea, and could only be better if it actually printed the all-important bar code rather than the little red "x" of IE broken image sorrow. It is vitally important to run alsamixer and mute all your sound channels before sending a birthday e-card to your mom. You will not be able to click through before the flash loader starts making noise. NerdBooks.com is really cool, and potentially very dangerous. If you're catering a convention of laptop-toting computer geeks, it's probably a good idea to avoid serving things like soup and saucy pasta. "Healthier Burger" is pretty good, but it's not $9 good. Don't park your BMW under the trees in Addison. Just trust me. No matter how much my desk job might frustrate, at least I'm not pressure-washing the bird crap off of the parking lot every night at 1 AM. Last year I was always looking in from the outside at the little Cheerio-like clusters of people who already knew each other; this year I'm part of one. Acceptance rocks. Getting paid to have this much fun is damn nice. This would be where I offer some sort of deeply insightful conclusion that transforms the way you perceive the world around you and is a turning point in your journey toward greater enlightenment... But I'm too lazy, so you'll just have to use your imagination.